What is Pope Francis talking about? He blames accusers for creating scandal. 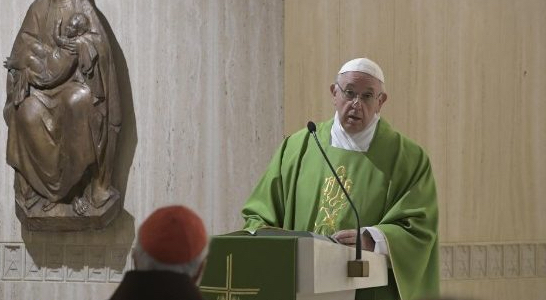 Vatican News information system reported that in his homily on September 11 “Pope Francis said it seems the ‘Great Accuser’ is attacking the bishops of the Catholic Church to create scandal” (vaticannews.va). However, from the faithful’s perspective, the Pope has it backwards. The definition of scandal is “an attitude or behavior which leads another to do evil.” One causes scandal when one gives another the impression that something evil is good, or that something good is evil. The Catechism teaches “scandal takes on a particular gravity by reason of the authority of those who cause it” (CCC 2285). If those in authority are promoting bishops to cardinals who despise and distrust the longstanding teaching on the proper use of genital activity and procreative powers, those in authority–including bishops–are giving scandal to the faithful. If bishops are assigning as tribunal judges priests who reject the Church’s teaching on sexuality as demonstrated by priests’ ongoing homosexual activity, those priests should not be judging anyone else’s obligations regarding marriage and sexuality. The canon law requires “Judges are to be of unimpaired reputation and doctors or at least licensed in canon law” (1421 §3). Active homosexual tribunal judges, some of whom are predators, have been reported in Saginaw MI (Sept. 2018), Chicago IL (Sept. 2018), Roman Rota (March 2018), and Tuscon AZ (2002). Readers can only guess to whom the Pope is referring when he says “the ‘Great Accuser’ is attacking bishops.” This appears to be the Pope’s reaction to Archbishop Viganò, whose testimony alleged that Pope Francis covered up for homosexual predator Cardinal Theodore E. McCarrick and promoted McCarrick. 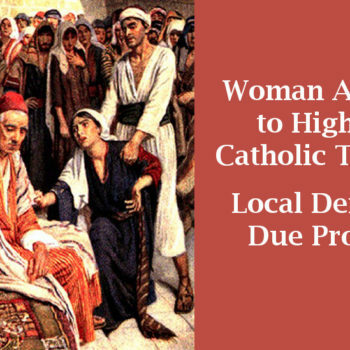 The Pope may also consider the “Great Accuser” to be the signers of the Catholic women’s petition, including Janet Smith, Kathryn Lopez, Teresa Tomeo, or the signers of the men’s petition, such as Scott Hahn, Al Kresta, and Michael Pakaluk. The bishop cannot remain distant from the people; he cannot have attitudes that take him away from them… He doesn’t try to find refuge with the powerful or elite. No. The ‘elites’ criticize bishops, while the people has an attitude of love towards the bishop. This is almost a special unction that confirms the bishop in his vocation. The patience of the faithful is wearing thin after years of enduring bishops and priests undermining, in actions and words, the longstanding Church teaching. The faithful are the ones whose families are being ripped apart by the temptations of the secular culture to abandon marriage, commit adultery, conceive children out of wedlock, abort babies, selfishly and pridefully demand one’s own comfort, etc., etc. The faithful are clamoring for our bishops and priests to teach the good news of following Christ’s plan for humanity. If Pope Francis is concerned about bishops’ and priests’ right to a good reputation, he is missing the distinction between priests/bishops giving scandal, and the faithful’s plea for the scandal to stop. Archbishop Viganò and the petitioning faithful are not giving scandal. Those in positions of authority are obligated to work to stop the giving of scandal, not cover it up, nor promote and relocate those giving scandal, so more souls will be given the impression that evil is good. When bishops and priests give the impression that evil is good, the ones suffering are victims of the evil deeds perpetrated by other members of the faithful. Any good father knows he is responsible to try to teach a wicked son to cease victimizing his brother. The faithful expect the same from the bishops and priests. When pointing out that “it is not lawful for anyone to illegitimately harm the good name which someone enjoys,” this provision indicated two things: that everyone—the Hierarchy, the other members of the faithful, and, in the last analysis, any human being–should respect a good reputation of all general, and that harm can be done to this good only when there may be legitimate reason for doing so. In fact except the case of the sacramental seal– which is sacred and cannot be violated under any pretext” (CCC, 2490; c. 983 §1)—divine law at times gives authorization to uncover defects, sins or crimes whenever a higher good belong to all people, to civil society or to the Church is involved. Ecclesiastical law simultaneously contemplates concrete situations, such as those which institute of procedural action—if such a right exists in the case in question–the publicizing of which might perhaps diminish the reputation of the defendant. But, on all other occasions, in which neither ecclesiastical law nor divine law can serve to legitimate it, it is unlawful to act to the detriment of the good reputation of someone (see source). Presently, bishops’ reputations are at stake. The Pope’s reputation is at stake. Furthermore, a higher good belonging to all people is involved. The faithful have the right to be taught the actual teachings of Christ as handed down by the longstanding teaching of the Church. If bishops and the Pope are sending out priests who distain the Church teaching, who lead the faithful to believe that evil is good, those priests and bishops have to be stopped.